K.A. KITCHEN, G.A. GABALLA, « Ramesside Varia II. », ZÄS 96, 1969, p. 14-28 1 citation(s). p. 23 27 pl. viii fig. 8 . K.A. KITCHEN, « Egyptian New-Kingdom Topographical Lists.  An Historical Resource with “Literary” Histories », dans Th. SCHNEIDER (éd. ), Causing His Name To Live. Studies in Egyptian Epigraphy and History in Memory of William J. Murnane, CHANE 37, 2009, p. 129-135 9 citation(s). K.A. KITCHEN, « The Strengths and Weaknesses of Egyptian Chronology: a reconsideration », ÄgLev 16, 2006, p. 1 citation(s). K.A. KITCHEN, The Third Intermediate Period in Egypt (1100-650 B. C.), Oxford, 1996 32 citation(s). K.A. KITCHEN, « The Physical Text of Merenptah’s Victory Hymn (The “Israel Stela”) », JSSEA 24, 1994, p. 71-76 1 citation(s). K.A. KITCHEN, « A Note on Bandeau Texts in New Kingdom Temples », dans Studien zu Sprache und Religion Ägyptens, 1, Göttingen, 1984, p. 547-553 1 citation(s). K.A. KITCHEN, Pharaoh Triumphant: the Life and Times of Ramesses II, Warminster, 1982 2 citation(s). 4 974 645 visites - 1 930 visite(s) aujourd’hui - 2 connecte(s).